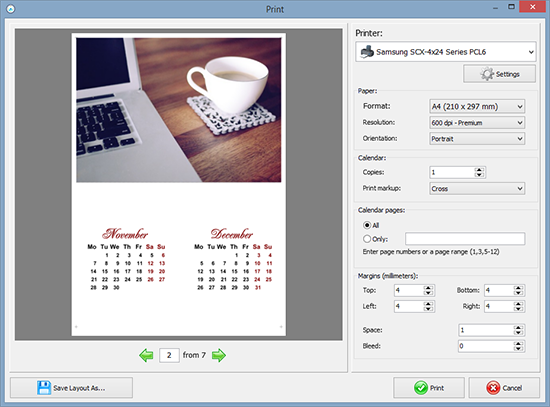 Photo Calendar Creator is equipped with a user-friendly print module so you can print your calendar out on paper of any format. Trim lines and bleed printing, necessary for professional printing, are also supported. When you're making a multipage calendar, you can print one or more specific pages so you can save paper and make sure everything is printed correctly. The program automatically generates print layouts for flip calendars, taking into account folds and trim lines. Create a calendar to print with Photo Calendar Creator and share it with your family or colleagues!